1: Visit the shop and register for all the things your child has been dreaming of with a one-on-one service experience. This is similar to creating a wedding registry- you/your child pick the things that the child wants for Christmas and we will scan them into our system- ensuring you get exactly what they want and that there will be no duplicate gifts. You are welcome to pop in at anytime to check on your families registry and modify it if need be. 2: Upon registering a child we will ask you to supply the child’s first name, age and a few things he or she has excelled at throughout the year as well as a few they may need a bit of help with. This helps Santa when he writes his personal letter to the child. 3: Tell everyone you have a registry and they can come in and shop it while receiveing FREE gift wrapping services. 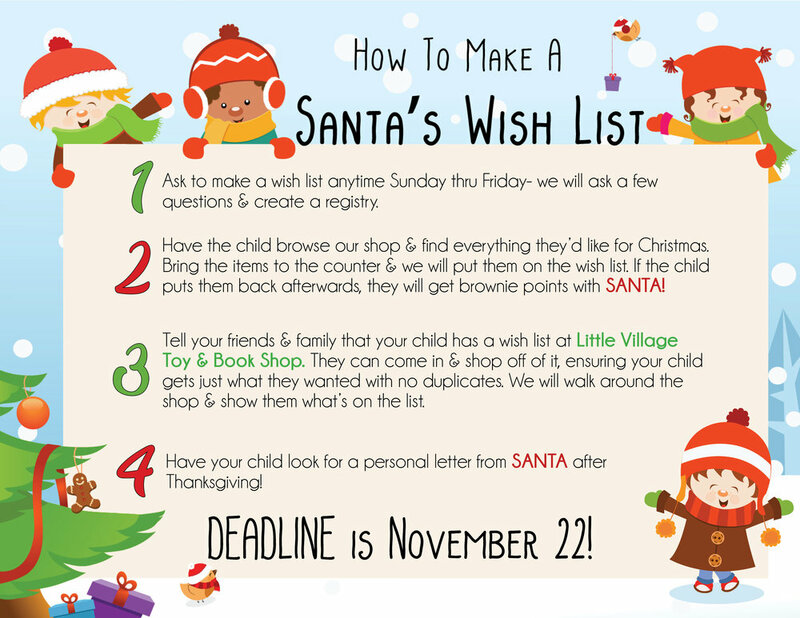 We can assist them in finding the items on the wish list and make their shopping experience a pleasant one. 4: Look for your child’s personal letter after Thanksgiving from the BIG MAN himself. These have become quite the hit in town.